A solid choice for a convenient and nutritious breakfast or traveling snack, muesli is a raw version of granola and doesn’t have the added oil or sweetener. 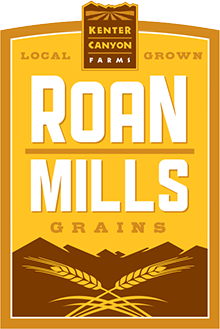 Our Roan Mills organic emmer packs a whopping 18% protein and when combined with milk, nuts and seeds makes a very respectable contribution to one's daily nutritional needs. Traditionally, muesli is soaked in milk overnight to soften it and make it more digestible. A stash of the soaked grains, nuts and seeds would often be stashed in the fridge all week, with fresh fruits and berries added to individual servings at the last minute. This idea is still relevant and in the Roan Mills test kitchen we keep a big bowl of muesli going during the hot summer months. The cool, creamy cereal makes a refreshing breakfast or afternoon snack. A dollop of yogurt, a spoonful of honey and a splash of milk will loosen the texture and vary the flavors to suit the moment. Layered into a mason jar, with milk and fresh fruits, muesli makes a good traveling companion, softening as the day goes by into a satisfying mid morning snack. Combine dry ingredients and store in large jar to enjoy as needed. To soak overnight, for a single serving, scoop out ¾ of a cup of muesli and combine with ½ cup milk or kefir. Add grated apple, sliced banana or fresh berries to taste just before serving. Loosen the texture to taste with more milk, kefir or yoghurt.